Summer is upon us. (Maybe, I did see a ton of sweater and coat comments in my FB feed over the weekend from my friends up north.) One of the things that I love about summer is the fresh produce, farmer’s market and being able to get great prices on fruits and veggies throughout the summer. One veggie in particular is usually easy to find at super low prices…zucchini. Zucchini is super easy to grow, and is often in abudance, hence the low prices. I once visited a farmer’s market in NYC, 2 years ago I think!, and the stack of zucchini was priced at $.99/lb. That’s CHEAP for NYC prices, and it wouldn’t be unusual to find it as low as $.49/lb in other parts of the country. If I had to “pick a price,” I wouldn’t pay more than $.79/lb for zucchini in the summer…and stock up when you see it any lower than that. Favorite veggie side, we had green beans! 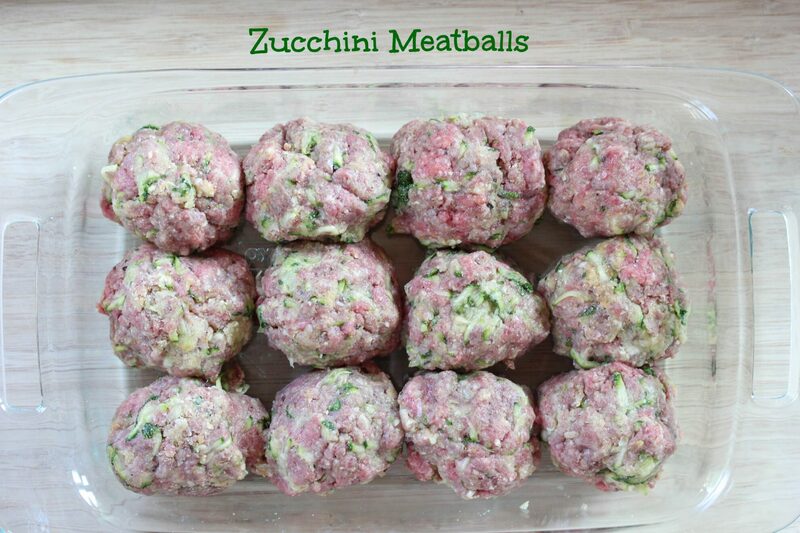 In a large mixing bowl, combine the ground beef, zucchini shreds, egg, bread crumbs, Italian seasoning, salt and pepper. Form into large meatballs, mine were about 1 1/2 to 2 inches in diameter and I made 16 meatballs. Place into a glass baking dish (I used a smaller 7×11 glass dish, what you see above). Then top each meatballs with a little pasta sauce. Bake the meatballs in the preheated oven for 25-30 minutes, or until cooked through. Cooking time will vary depending on size and thickness of the meatballs. 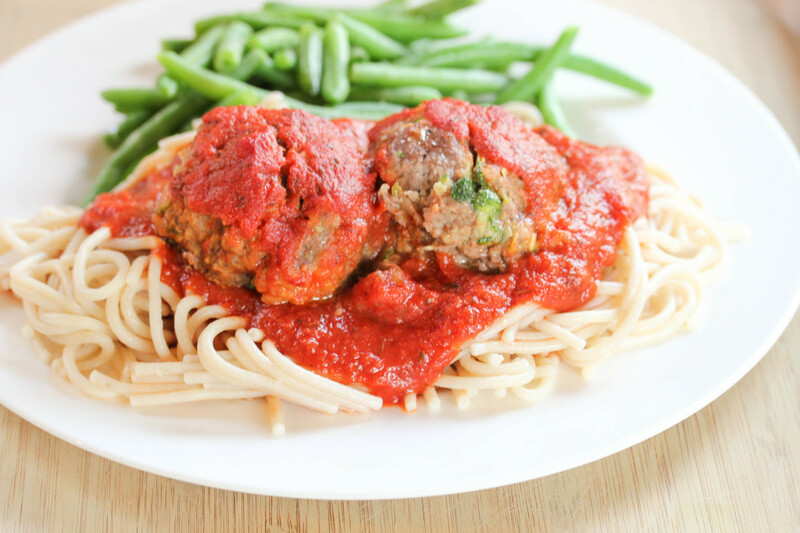 Serve Zucchini Meatballs over pasta and sauce with side of veggies. I don’t eat wheat. Can oatmeal be used in place of the breadcrumbs? Can these be cooked before freezing so that they can be pulled out for a last minute meal? I don’t use wheat either, I use small pearl tapioca in place of breadcrumbs in all my recipes and no one can tell the difference. It holds meat together wonderfully and is very moist. Is that 1 tsp. each salt and pepper or 1 tsp combined salt and pepper to taste. 1 tsp of pepper would be quite a lot for 1 1/2 lbs. of hamburger.